Have you ever placed a homeschooling curriculum or a resource in your wish list with earnest? Has it then kept slipping through your fingers for one reason or another? That’s just what had been happening for a while with the Lifetime Membership at NotebookingPages.com. To be fair, we’ve only dabbled with notebooking at our homeschool here and there. Yet, because I loved the concept, I did avail ourselves with a stash of free and inexpensive pages. I even created a few handsome pages myself. All in hopes to notebook more often. 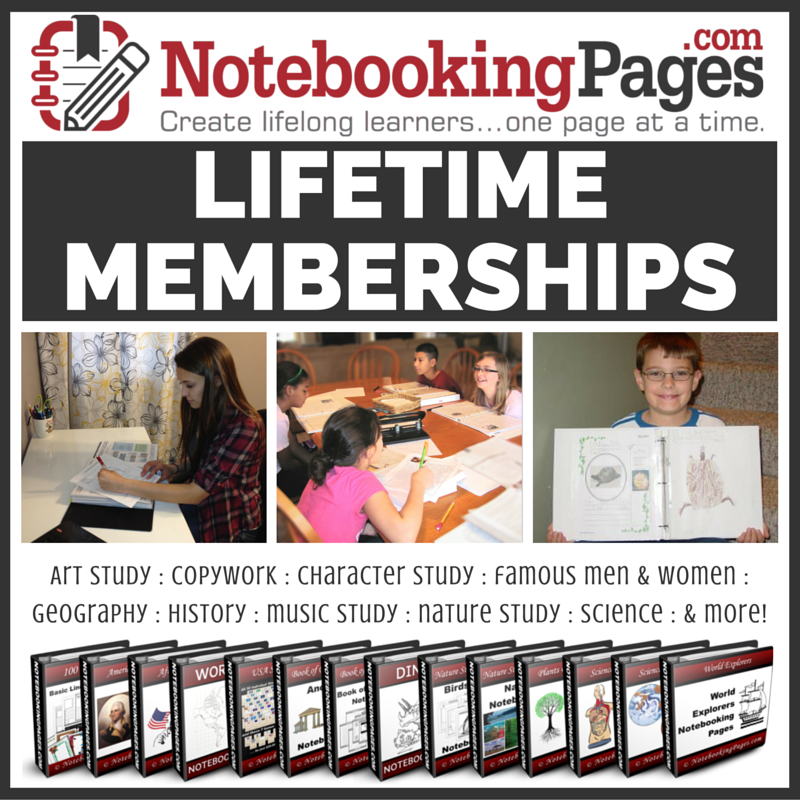 All The while, the NotebookingPages.com lifetime membership continued to elude us. Then opportunity knocked: The Crew offered it for review. Now that we’re all set up, Super Hero has been documenting his way through geography lessons with pages from the Lifetime Membership available from NotebookingPages.com. You can buy a lifetime membership for $97. And now, here’s my thorough and honest review of this fantastic homeschooling resource. If you haven’t heard of notebooking before, you’re in for a treat. Besides fine learning, many homeschoolers view notebooking as an avenue for self-expression. The child needs not only regurgitate facts, as with boring worksheets. Here, he has the chance to infuse the page with his own style and personality, especially if he’s the artistic sort. Even if he isn’t, notebooking allows freedom and much, much flexibility. Notebooking works with any homeschooling approach, and with just about any subject. So here’s the gist of it: the child reads a book, watches a video, or researches online. Then she narrates it to you, or not. Then she writes, or draws and colors, or glues images, or a combination of all into a page. She includes what’s most important to her. Or you may guide her with specific questions. She may decorate her page, or pick one that’s already decorated. Anything’s game. I think it wise to have a good mix: let the child do her own thing sometimes. And guide her to cover any salient points other times. Of course, a child need not notebook only after reading books or researching things. She could pursue anything she fancies and document her findings using notebooking pages. In due course, she will have a notebook of precious pages that you can leave in the binder or bind into memento books. Each category breaks it down even further with plenty subcategories and loads of topics. Plus they’re always adding more themes to the already bulky collection. Finding what you’re looking for is a snap. But, in case it isn’t, you may use a generic page, or you can create one with its publisher web app. Though the web app is not part of the Lifetime Membership, you get one year access for free. In a year, it’ll be $2.95 per month if you decide to keep it. If plain or decorated single sheets aren’t enough for ya, NotebookingPages.com also has 3D templates to sweeten the deal. (As stated on the first bullet above.) From layered mini books, matchbook mini books, foldables, popups, shutter folds and top tab books. You get them all to make learning even more hands-on. Talk about a treasury! NotebookingPages.com sure does deliver it! Alright so Super Hero’s still in the phase where he’d rather not write if he can get away with it. It turns out, he’s had zero complaints about writing his notebooking pages. Nothing! Nada! Granted, I allow him to take turns writing. He writes, then he dictates to me. But guess what! He’s written a few pages all by himself. And those he’s done on the web app, relatively long, I might add. Woohoo! He’s fallen in love with a geography coloring book these days. Aside from the “art” as he calls it, we read ample details about each country, region or continent. Isn’t it surprising how children can suddenly change their interests? He used to have no desire for coloring books just a few years ago. Anyhow, I ask him to tell me a brief summary afterward. I’m all for keeping the flame of interest shining bright. For sure nothing kills his enthusiasm more than a typical list of comprehension questions at the end of readings. So he just tells me anything that catches his attention, or believes it worth remembering. I may guide him to point out certain details should those be relevant. We carry a “focused conversation” perhaps more so than a “lesson.” I jot down a sentence or two for each section, then he copies them on his selected page. He loves to customize his pages with the web app as well, not to mention he prefers the keyboard for writing. Since we read a lot of literature, we use Literature Units from time to time. Some have been wonderful, but we do shy away from the usual Study Guides that abound out there. I scram from dull comprehension questions, and dry vocabulary memorization. Super Hero fears them even more, trust me! Oh yes! I did kind of mentioned that already. At any rate, we’re not always in the mood for a Lit Unit, or to study a book at such lengths. We just want to read it, savor it, love it, talk about it, love it some more and move on. Though we never quite move on from our favorites. Those we might reread or read them in Spanish. Now with notebooking pages, we have an easy way to savor and love a book as lightly, or as deeply as we wish. So, for “Number the Stars,” one of our recent reads listens, Super Hero picked a page with room for a drawing. He drew the Star of David, and he wrote what he learned about it after he researched it himself. He picked a page with a big map of Denmark. He spotted Copenhagen. He spotted Gilleleje, Uncle Henrik’s hometown. He then determined that Grønnehave was closer to Sweden than Gilleleje. –”Too bad that Uncle Henrik didn’t live there, but oh well, he still lived very close to Sweden anyway.” Talk about interest-led learning! Super Hero building conclusions from his observations all on his own. And NotebookingPages.com enabling this type of learning. I just couldn’t be more pleased. An awfully useful tip in the Starting Guide was to print the catalogs of topics you deem appropriate. This single tip has been a game changer for us. It was the missing piece in my attempt to adopt notebooking before. Tucked away on my computer made my original stash of pages inaccessible, and in the end, useless. At once, I printed a few catalogs to keep handy. Now all Super Hero has to do is spot the page he wants and off he goes. Can’t wait to get your hands wet with notebooking? Not ready to make a lifetime commitment? 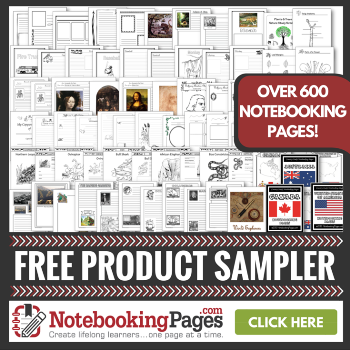 Then you can just get a taste of NotebookingPages.com by receiving free sample pages. Over 600 in all, pretty generous, don’t you think? As I said before, I couldn’t be more pleased with NotebookingPages.com. It’s such a fantastic resource to have on hand, I’m awful grateful to have lifetime access. I do want to mention, they include a meaty Bible pages section. And the Holiday pages offer only Christian holidays, apart from official U.S. holidays. Of course these are just part of the much bigger selection. You certainly need not download those if you don’t wish to do so. I like the pages because they’re fun to do. You remember stuff. I really like them! It’s simple. It works. It’s oh-so-flexible. And most important of all, Super Hero’s happy filling his pages. What more could a homeschool mom want? Feel free to read more reviews from the Crew team. Also visit NotebookingPage.com’s social media accounts. Perhaps you’d like to mingle with others in their community to learn more about it.